On Monday (Feb. 1), Google announced that its self-driving car program was simulating driving 3 million miles a day. As The Verge noted, that’s the equivalent of about 500 round trips between New York City and Los Angeles, and roughly 90 million simulated miles a month. The company also announced that, since 2009, its fleet of 55 autonomous cars have driven a total of over 1.4 million miles on actual roads around the Bay Area and Austin, Texas. 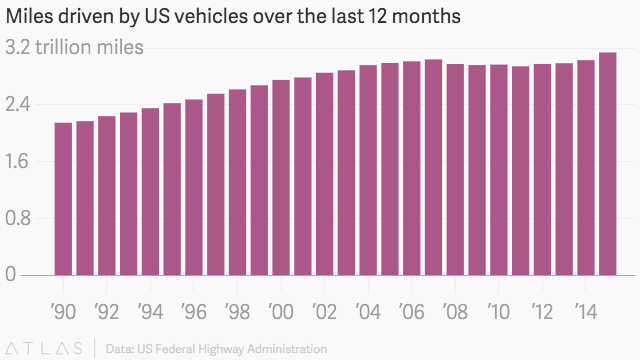 But it’s worth putting those numbers in some context: In November 2015, Americans drove about 253 billion miles, according to the US Department of Transportation’s Federal Highway Administration. Over the last twelve months for which the administration has data, Americans drove some 3.13 trillion miles. Google said in a release that it’s built a driving simulator that it’s using to teach self-driving cars about more driving situations without any of them having to leave the garage. It’s a practical way to grow the company’s driving knowledge base, and share that information across all its cars. However, it’s the rare situations—the ones drivers don’t tend to face on their average commute—that autonomous vehicles need to prepare for. While American drivers don’t share a collective consciousness as they rack up miles like Google’s cars do, there are still likely far more random occurrences in those billions of miles than there are in Google’s simulators, because real life is just so bizarre. Even when we do have self-driving cars on our roads—Toyota is working to deliver its first by 2020—there are still likely to be car accidents, though Pratt said he believes the number of car-related deaths will be drastically lower than they currently are. But how will people view the accidents? “We have incredibly stringent expectations of the performance and reliability for anything that’s mechanical,” Pratt said.